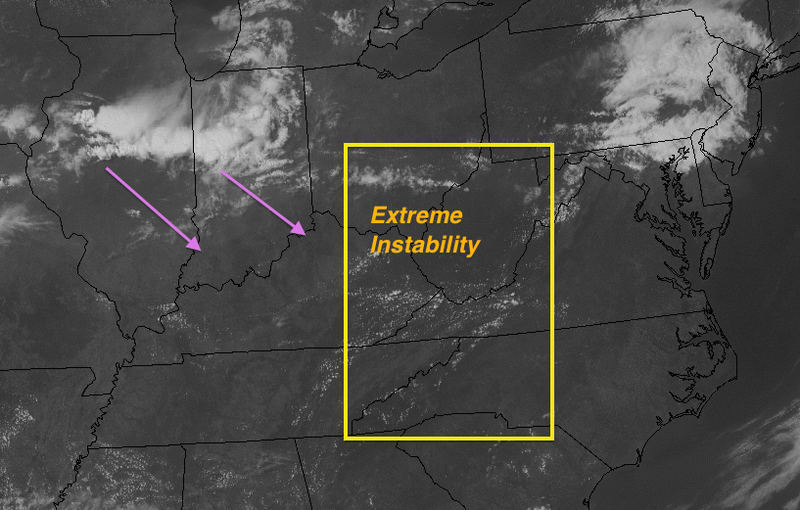 The air over the Appalachians is extremely unstable this afternoon. The thunderstorms over Illinois and Indiana are moving toward the increasingly unstable air. If the thunderstorms make it into the yellow-outlined area, there is a good chance they will cause large hail and/or strong winds. UPDATE: 3:13PM CDT: State of Virginia and District of Columbia both declare state of emergency. Add Indiana. 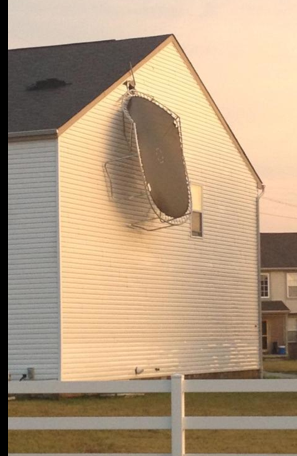 AccuWeather has numerous photos of the derecho's damage. Eight are dead and millions of homes and businesses are without power in the nine states that were in the path of yesterday's derecho. An animation of the radar depiction of derecho is here. CNN's overview of the storm is here. Even in the urbanized District of Columbia, it may be a week before power is restored. Washington Post's coverage is here. It will likely be two weeks in some areas elsewhere in the storm zone. 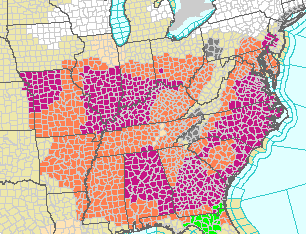 As the map above shows, extreme heat will revisit some of the areas that experienced the derecho and many will have to cope without air conditioning. The storm was so severe that Netflix, Amazon Cloud, Pinterest and Instagram lost service at one time or another. By the way, the worst heat in the nation yesterday was at Norton Dam in northern Kansas with 118°! Looking forward, there is a good chance of thunderstorms in some of the stricken areas later today and tonight. 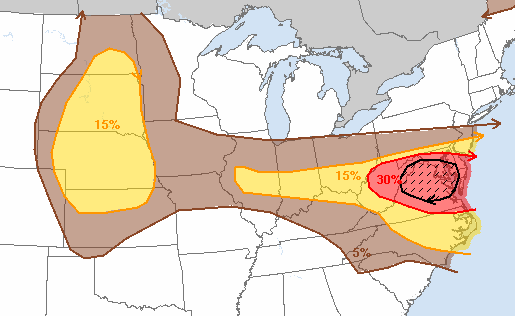 This is the probability of 1" or later hail map (hatched is > 2") with 15% the significant threshold. Things are relatively quiet now with just a few thundershowers on AccuWeather regional radar. 2:45pm Central Update: Death toll has risen to 13. Hat tip: Johnny Kelly. Mindy got this photo of mobile Doppler radars parked last evening in Park City, KS. I strongly suspect they are on their way back to Norman after working with a National Center for Atmospheric Research tornado research project this spring. They roamed from Texas to North Dakota. The goal of these radars is to get close enough to a tornado to get detail wind speed and wind flow measurements. Christy Looney is my 2,000th Twitter follower. You can follow my tweets @usweatherexpert. A "derecho" is a geographically long-lived windstorm and we've had major event the last twelve hours. 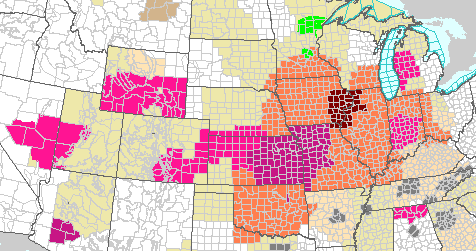 Courtesy of the NWS is a map of its extent -- and it continues in progress. Note the measured wind gust of 91 mph! Hundreds of thousands of homes and businesses are without power. 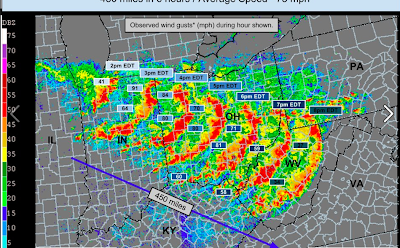 Here is a map of the reports of winds of 60 mph or more (blue) and 75 mph or more (black) up to 3am CDT. ADDITION: The map of the derecho was done by Greg Carbin of the NWS's Storm Prediction Center in Norman, OK. Sorry I initially forgot the acknowledgement. Thanks Very Much, Book Readers! Just looked at this week's sales figures for Warnings: The True Story of How Science Tamed the Weather and When the Sirens Were Silent. In the last four weeks people from Los Angeles, Philadelphia, Charlotte, Denver, Colorado Springs, Nashville, Washington, D.C., and just about everywhere in between have purchased copies of these books. Looking at all of these plotted on a map is quite gratifying. Thank you. Earlier this week, I wrote about Amazon being down to one copy of Warnings. They received seven more copies (bringing them to 8) but are now back down to three. So, if you need a copy in the near future, just click on the link. Amazon has adequate stock of Sirens. 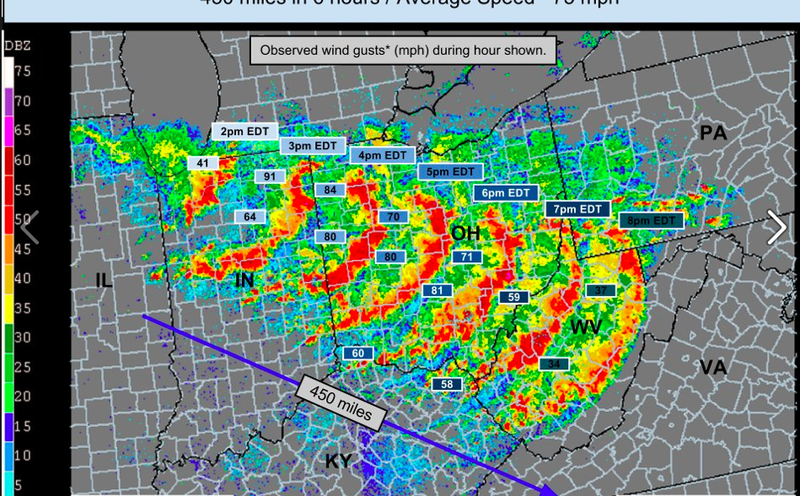 Wind gusts to 75 to even 85 mph have been common with this system. Literally tens of thousands of homes and businesses are without power and the power may be off for some time due to the extent of the damage. I strongly advise people in these areas to bring items that can be blown about indoors and to listen for later weather information as the storms approach. 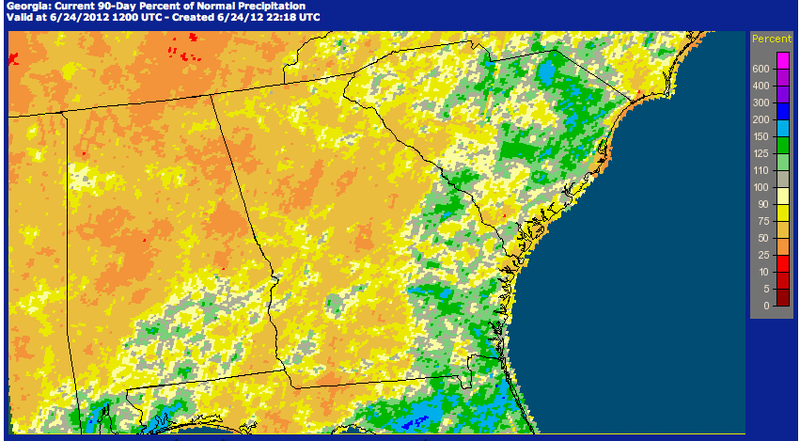 The record temperatures ahead of these thunderstorms will -- at least for a time -- be broken by the rain-cooled air. Temperatures may drop as much as 30° in five minutes! 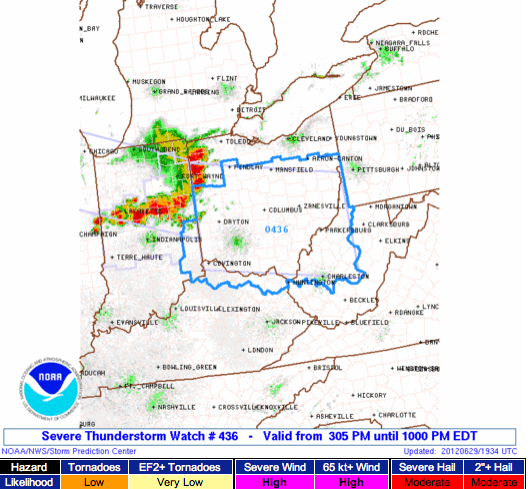 I don't normally blog about severe thunderstorm watches, but a line of thunderstorms is moving into Ohio that may cause winds in excess of 75 mph in gusts. Note the probability of winds 65 knots (75 mph) or higher is "high." Please stow lawn furniture, trampolines, and other items that might blow around if you are ahead of this line and keep up with the latest information. Politics, the art and science of winning elections, is of zero interest to me. However, the workings of our government and the use of our tax dollars is of great interest. We keep hearing how the federal government is getting squeezed by budget cuts. 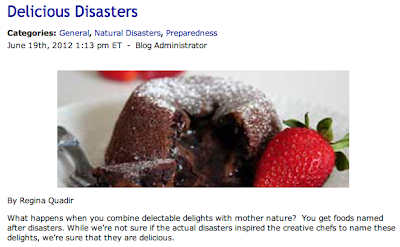 If that is true, how is it that the Centers for Disease Control has sufficient resources to be publishing articles about the naming of desserts? Was thrilled to hear the news today that Len Dawson, the Chief's quarterback, Super Bowl MVP, and member of the Pro Football Hall of Fame is going to be inducted a second time. He is the 2012 winner of the Rozelle Award for his work in broadcasting. Len and I started our broadcast careers at the same place: KMBZ Radio, then the #1 radio station in Kansas City. Len started in 1966 as sports director and I started doing weather for them in 1967. We would run into each other in the studio from time to time and he was always courteous and encouraging to this teenager. He is a real gentleman. Mike Smith will be the featured weather expert at the 2012 Bombardier Safety Standdown held in October at the United States location in Wichita, Kansas. Mike will be presenting his avation themed speech CSI: Meteorology, the inspiring behind-the scenes story of a courageous scientist who, in spite of tremendous opposition, makes everyone who flies today much safer. Charlie Neese's Comments on "When the Sirens Were Silent"
Click here to read his thoughts about storm sirens. 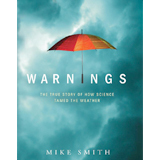 Amazon Down to One Copy of "Warnings"
Here we go again: As of the moment I am writing this, Amazon is down to one copy of Warnings: The True Story of How Science Tamed the Weather. The last time this happened, they were out for ten days! So, if you need a copy for a gift or other purpose in the near future, please order right now. If they are out by the time you get to them, Watermark Books ships and has them in stock. Having been in Colorado in the last two days, the fire danger is beyond extreme. 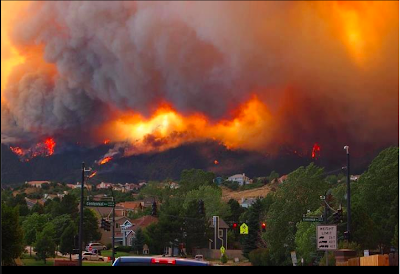 The Colorado Springs fire is depicted below from yesterday. It goes without saying that if you are in one of these areas please be extremely careful with anything that could ignite. ...is an idea whose time has come. USA Today has the details. Of course, it is weather science that makes these useful because we usually give enough warning for people to have time to drive or walk to the shelters. 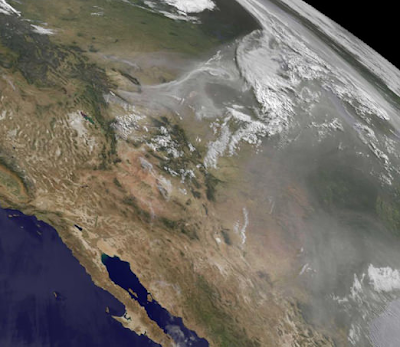 Someone ought to write a book about all the progress in weather science the last decade. Such a book might be a great summer vacation read! Mike Smith is not a scientist who sits behind a desk all the time, or one who only looks at computer models, or one who only talks to other scientists. Mike is a scientist who rolls up his sleeves, gets among the storms, who talks to clients, who never stops learning. Mike is willing to go beyond the radar to stand alone against the storm. 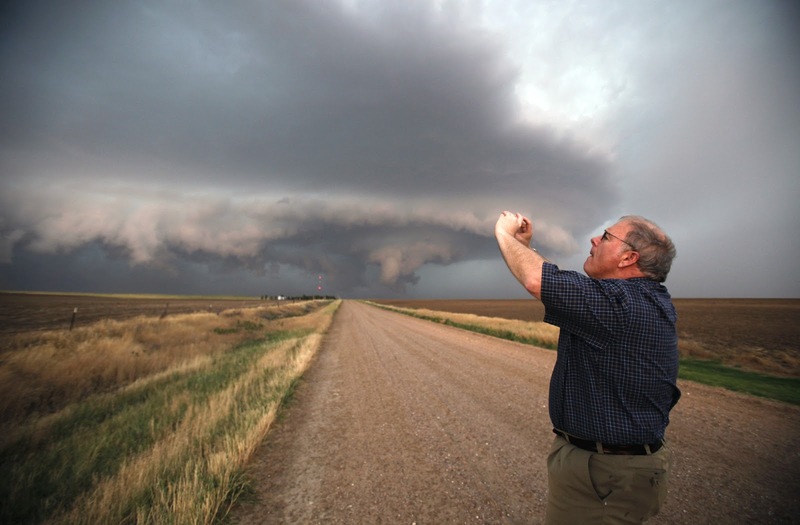 He likes to approach everything in life by surveying the storm in its entirety to get the "big picture. These are a few of the reasons that Mike is a nationally known speaker, author and innovator and why many businesses, organizations and civic clubs have requested him as a speaker recently. Mike will be sharing his wisdom with the Life Ventures Group- Adventures in Learning in Wichita this fall 2012. Mike will be discussing his newest book, When The Sirens Were Silent in his presentation and will be signing books after the program. For information on having Mike as a guest speaker to your business club or organization please visit www.mikesmithenterprises.com for more information. Map from Greg Carbin of the NWS's Storm Prediction Center. 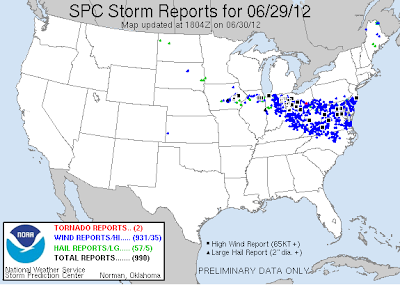 Where was one fatality from these tornadoes. 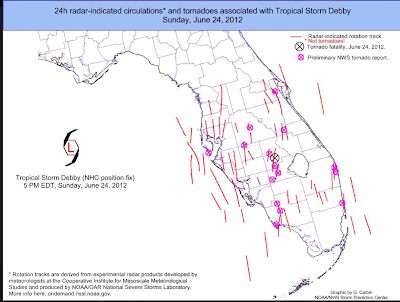 Some tropical systems are prolific tornado producers. The AccuWeather regional radar above shows thunderstorms in the Northeast. Medium to huge delays are affecting Toronto, Boston, NYC, and Richmond. 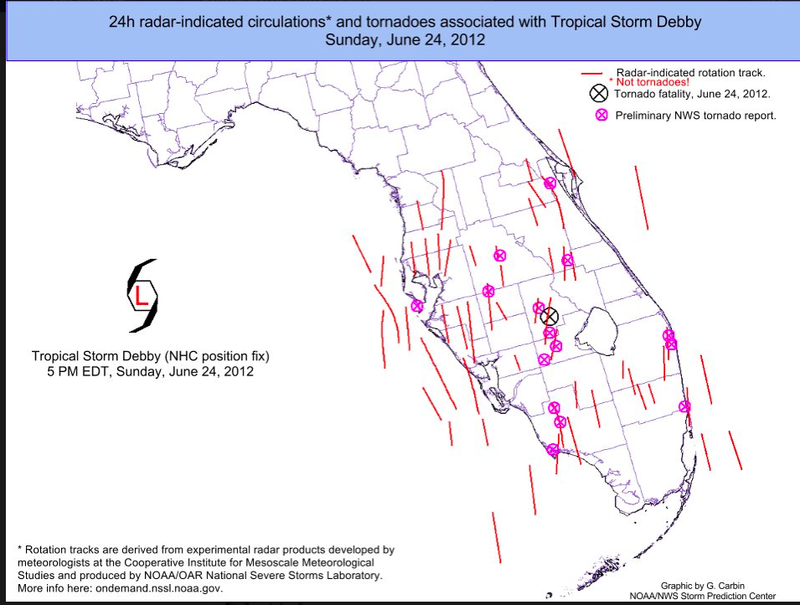 Add this to some disruptions in Florida due to Debby and the mess is spreading across the U.S. I'm changing planes in Denver at the moment and the lines at customer service (for rebooking) are quite long. This is a good time to check your specific flight if you have one this afternoon or evening. The best way is to go to your airline's web site and click on "flight status." Have your flight number ready. Debby's forecast track has been turned more to the east. It is expected to slowly weaken over the next three days. 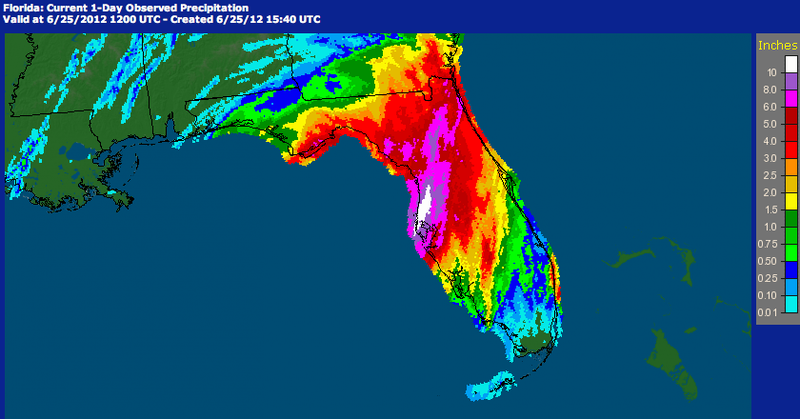 As expected, rainfalls have been very heavy so far in Florida. This ended at 7am CDT this morning. Starting at 7am, here is the forecast additional rainfall for the next five days. Finally, a tornado watch continues in Florida. 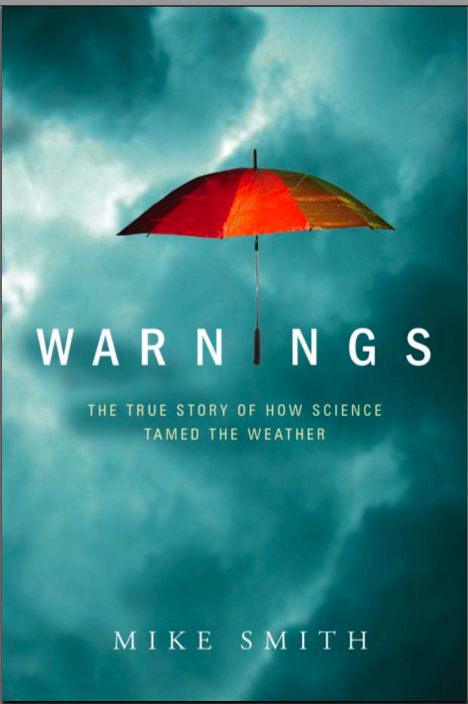 If you are a high school or college teacher, please consider using Warnings: The True Story of How Science Tamed the Weather in the upcoming fall semester. Teachers of science, meteorology, and literature have used it successfully. With more than 20" of rain predicted along the Florida coast, Debby is going to dent the drought big time. Here is the percent of normal rainfall for the last 90 days: Much of the region has received half or less of its normal three month rainfall. 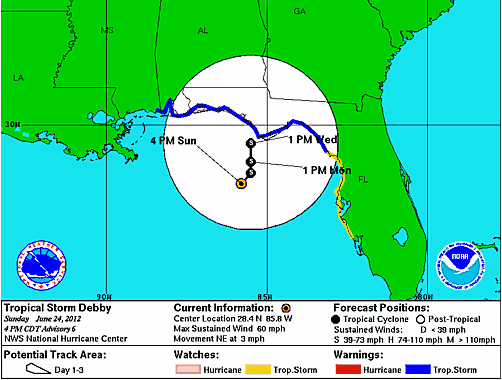 Debby is now expected to continue moving north and make landfall in the Florida Panhandle as a strong tropical storm (not hurricane). 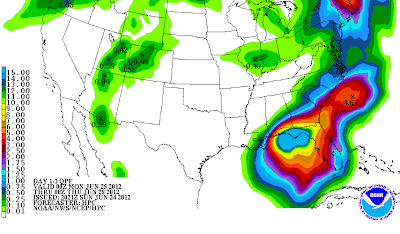 Very heavy rains are expected to accompany Debby and this will ease the severe drought in parts of the Southeast. 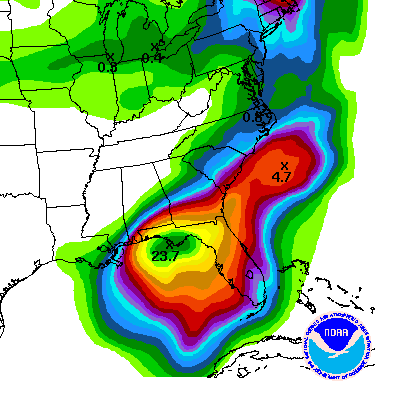 Three-day rainfall along the Florida coast is expected to be at least 15 inches! That rain will move inland the end of the week. Three tornado warnings are also in effect as of the time of this posting. This is a result of the proximity of Tropical Storm Debby. 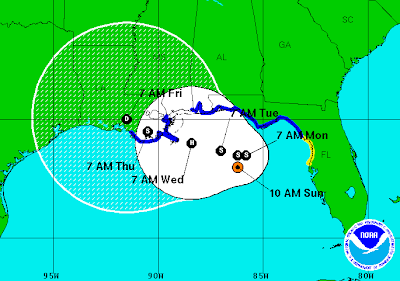 The latest forecast from the National Hurricane Center has Hurricane (Cat. 1 intensity) striking Louisiana Thursday night. However, this is an extremely low confidence forecast. The European model which has, by far, the best track record says it will go west. 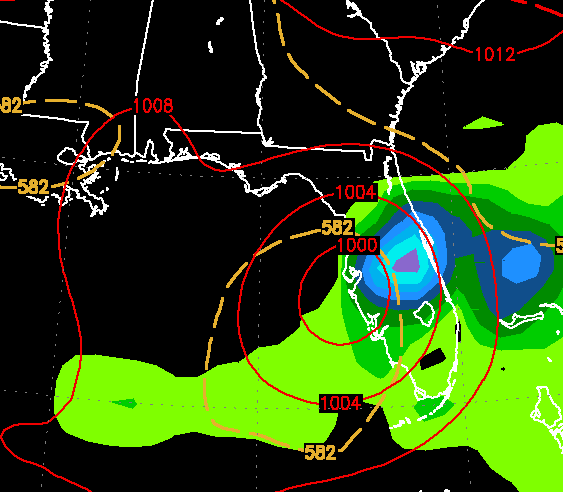 The GFS model says it will hit Florida. 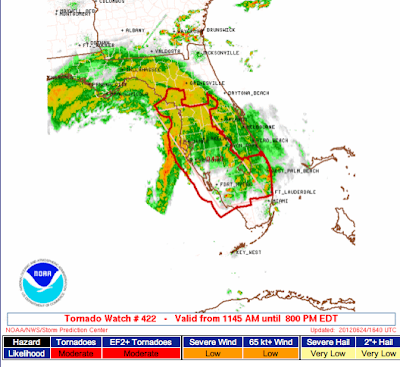 My advice: If you reside or are vacationing in the northern Gulf coast (Victoria, TX to New Orleans to Tampa) pay attention to the weather forecasts and warnings. 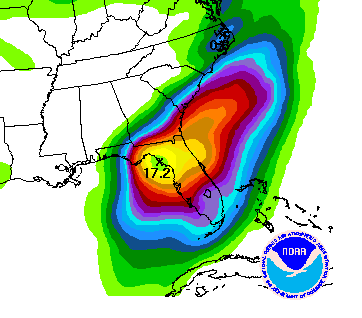 Wherever it comes ashore, heavy rains will occur. 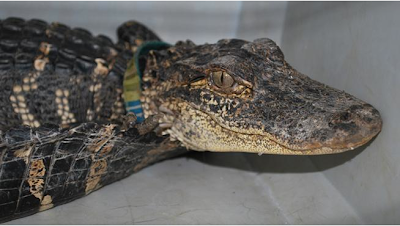 Two to three foot alligator with a pet collar found in Connecticut -- at a bus stop -- no less. 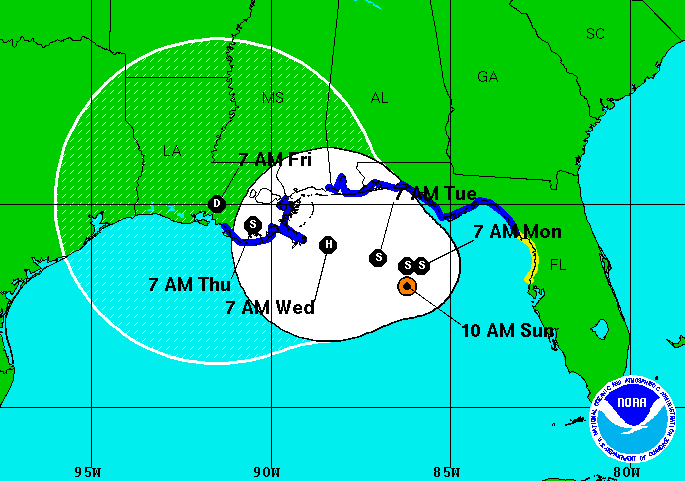 People along the Gulf coast should begin to pay attention to the storm. AccuWeather has more. Huge flooding in Pennsylvania and surrounding areas this week in 1972. AccuWeather, based in State College, PA shares stories about the historic storm. 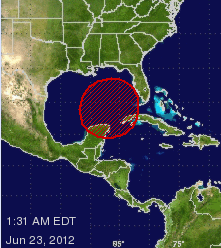 According to the National Hurricane Center, there is an 80% likelihood we will have a tropical depression or worse in the Gulf in the next 48 hours. 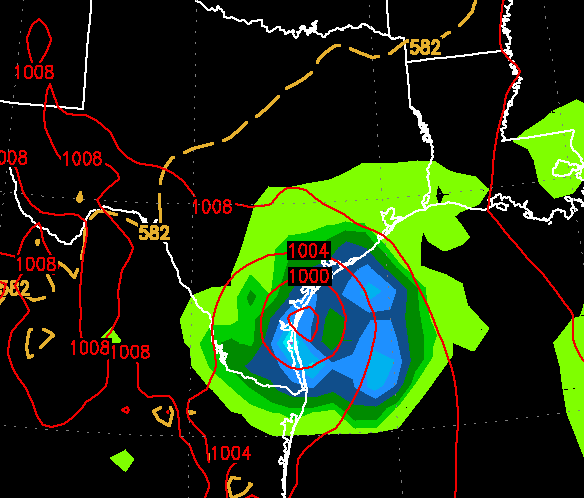 Unfortunately, the computer models are all over the place as to its eventual point of landfall in about 4-5 days. The European, usually the best, has it striking the Texas coast. 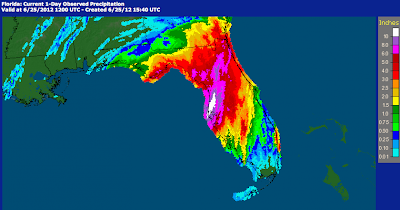 The U.S. model depicts it striking Florida. And, there are models showing landfalls at various locations along the Gulf coast in between. 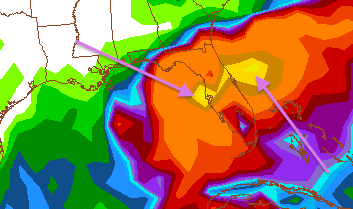 One thing that seems certain is very heavy rain will fall with this slow-moving system wherever it makes landfall. Using the U.S. model to illustrate, the two arrows point to 20" totals (!) for the next seven days. The two maxima are surrounded by the yellow which is a forecast of 15 inches. 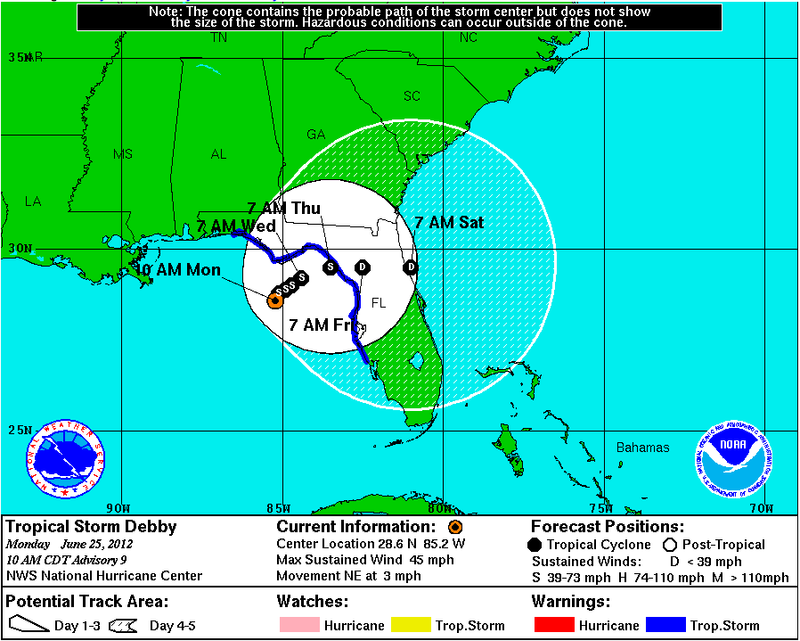 So, what to do if you have plans to go to the Gulf states next week for vacation or business? Keep an eye on the AccuWeather.com hurricane products. Keep an eye on this blog. If you are flying, keep an eye out for waivers. United's are here. Waivers allow you to change your air travel plans without penalty. Or, you can get a full refund in certain circumstances. In addition, here is my Airline Survival Guide. Print it out and take it with you. If you decide to travel into these areas be proactive. Remember, these days the airlines are full. If you don't get rebooked quickly, you could get stranded. This morning I had an enjoyable time giving a speech to the Pennsylvania League of Municipalities and Cities at their annual meeting in Pittsburgh. After, I headed to the airport to fly to Chicago, change planes, and then on to Wichita. Unfortunately, both of these flights involved the notorious Concourse F at O'Hare ("where the fall of Saigon is reenacted daily"*). 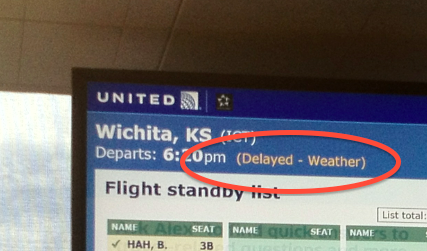 As always, United flight 5545 to Wichita showed up as "on time" on the monitor. So, even knowing (based on past experience) there was an excellent chance there would be an unadvertised delay, I headed for the gate in order to arrive about ten minutes before the scheduled time for boarding. I asked the gate agent if the plane that was going to take us to Wichita was on the ground. If the incoming flight was late, I'd resume doing the work I interrupted to go to the gate. Agent: The flight to Wichita will be on time. Me: That is not what I asked. I would like to know if the plane that is going to take us to Wichita is on the ground. Agent: Sir, the flight will be on time. Me: All I'd like to know is whether the plane is on the ground. Does it take 35 minutes (the interval between her telling me the plane was on the ground and the time it arrived at the gate) to taxi? Given zero weather, I vote no. So, let's go searching for this mysterious "weather." In the background of the wide shot photo above, you can see there is no weather to the east. Below is a photo looking west. No weather there, either. Let's look at the radar. Maybe the weather is there. Nope! There was no weather in either South Bend (where the plane came from) or Calgary (where the crew came from) or along the routes from either city to Chicago. When we eventually boarded the plane the captain came on the PA and (to his credit) said, "I know they were telling you it was a weather delay. The real reason for the delay was our late arrival from Calgary." Telling us in the terminal the delay was due to weather was another example of the all-too-frequent airline lie. As a meteorologist, I have seen this inaccurate blaming of weather time and time again. What would be the airline's motivation for these all-too-often false assertions of weather as the cause of a delay? I the answer may lie in United Airlines' contract of carriage (C of C). In other words, they don't have to do much for you if weather is the cause of the delay because it is "beyond their control." UA will promptly provide Passengers the best available information regarding known delays, cancellations, misconnections and diversions, but UA is not liable for any misstatements or other errors or omissions in connection with providing such information. So, they can -- and do -- tell untruths to passengers and then disclaim liability for "misstatements." Since the vast majority of their passengers are not meteorologists, they get away with it. I'm hardly the first to write about the airline lie. Another essay is here. There are literally dozens of articles that can be found by Googling "airline lies." Like the author of the piece at the first link, I favor re-regulating the airlines. I wrote a 7-part series on this topic in 2010. The summation is here. At the bare minimum, the Federal Aviation Administration should strike the C of C disclaimers of liability for intentional misstatements of fact. No other industry gets away with this. Airlines shouldn't either. Geez, I'm almost starting to be ashamed of the public officials in Kansas. Then again, things must be great in Kansas lately (I'm changing planes at O'Hare and have been away for six days) with no crime, no fires, no traffic accidents, and no heart attacks if the biggest thing Kansas public safety officials have to complain about -- and they have, many times lately -- is storm chasers. The incident in question was a month ago. Mr. Fisher and/or the reporter seem to have their terms mixed up. By definition storm "spotters" are stationary. It is storm chasers that move. 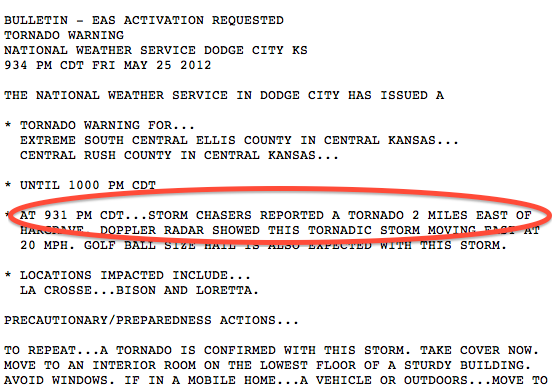 Real storm chasers know how to stay out of trouble when they are moving. Storm spotters likely will not. Here one of the tornado warnings in question. I've circled a key phrase. 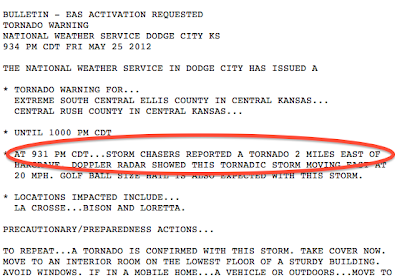 So, the key information needed to warn his community came from storm chasers. If I were Mr. Fisher I'd be making appreciative comments rather than the ones he's quoted as making. Whether it is tornadoes like the giant F-5 that struck Joplin or small tornadoes like the one I photographed below a few days after the LaCrosse storm, it is storm chasers that often provide the vital "ground truth" needed to warn the public. One of the tour members told a Rush County storm spotter he had paid $1,000 to storm chase and he had every right to be there. The tour member is absolutely right. Provided he/she was not breaking any law, storm tourists have as much right to be there as anyone else. As a proud Kansas resident and taxpayer let me make a plea to local officials: Quit complaining and reach out to the storm chase community. It will make your job easier (really! ), help save lives, and -- if you town becomes known as "chaser friendly" -- might but some extra tax dollars in local coffers as chasers purchase meals or spend the night at a local hotel/motel. Guest Editorial at the "Capital Weather Gang"
Ever Wonder How Maps Get Made? Amazon Running Low on "Warnings"